When I spied this AWESOME editorial photo shoot by JUCO for Alarm Magazine recently, I was completely inspired! So I endeavored to see whether something similar could be re-created affordably as a photo booth backdrop for a party. Firstly, take a look at your own ‘party closet’, or around the house for bright and fun items that can be used. Do you have any favors from past parties stashed away? 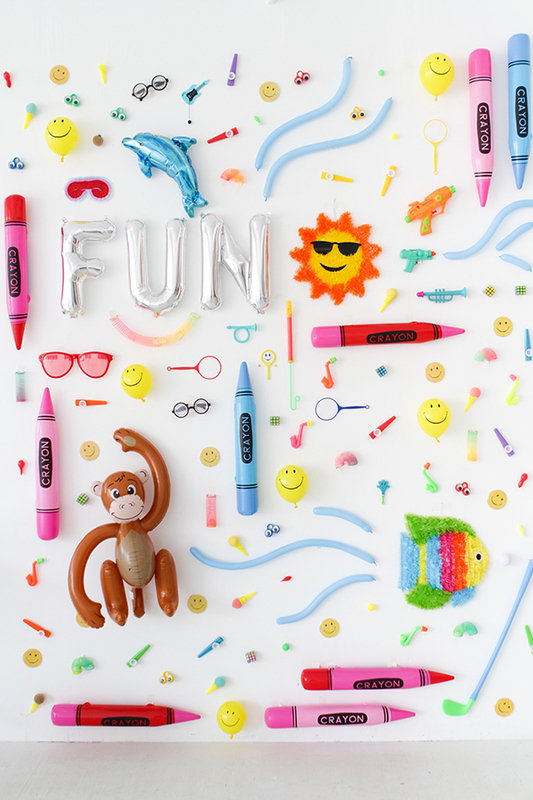 Start with sourcing inexpensive ‘big’ items that will use up a lot of real estate in your backdrop and therefore offer the most ‘bang for your buck’ e.g Party City sells these good-sized inflatable fish in packs of 3 for only $1.99. Some great sources for novelty toys and party favors that I used include dollar stores, Party City, Daiso (everything is $1.50!) and Amazon Prime. Variety is a key factor however the majority of value packs I found only offer multiples of the same item. However, Amazon sells a few 100 piece packs for around $15-$20 which provide a great deal of variety, like this one. 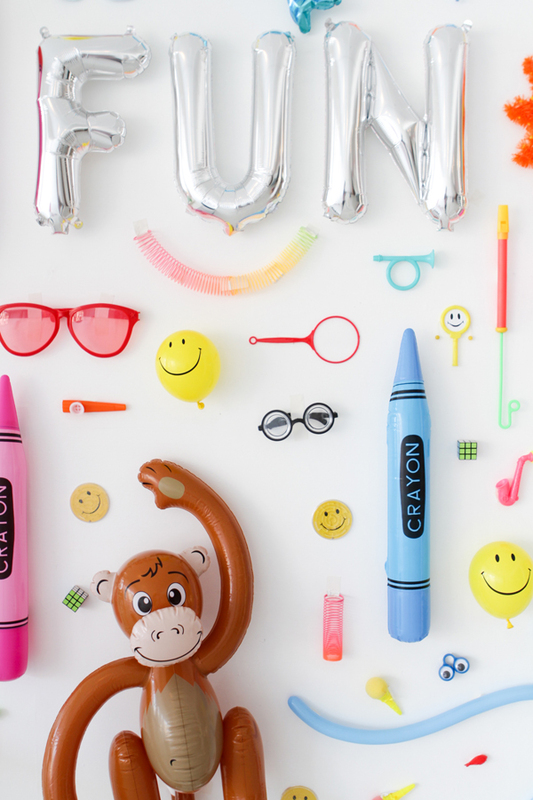 Long balloons and mini slinkys are both good buys- you can create fun and dynamic shapes from them and they also use up a good deal of real estate. 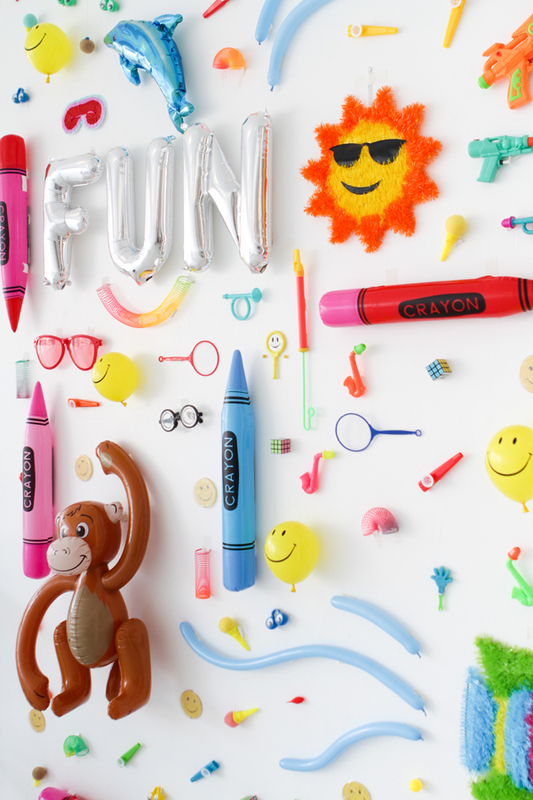 Simple balloons are also a great way to add a range of color and fun to your wall and they’re relatively cheap! This large inflatable monkey (a mere $2.99), that I found at Party City, provides a quirky element and also takes up a good deal of space. I personally love these giant inflatable crayons from Amazon! They come in a variety of colors and once again, take up a good deal of space. 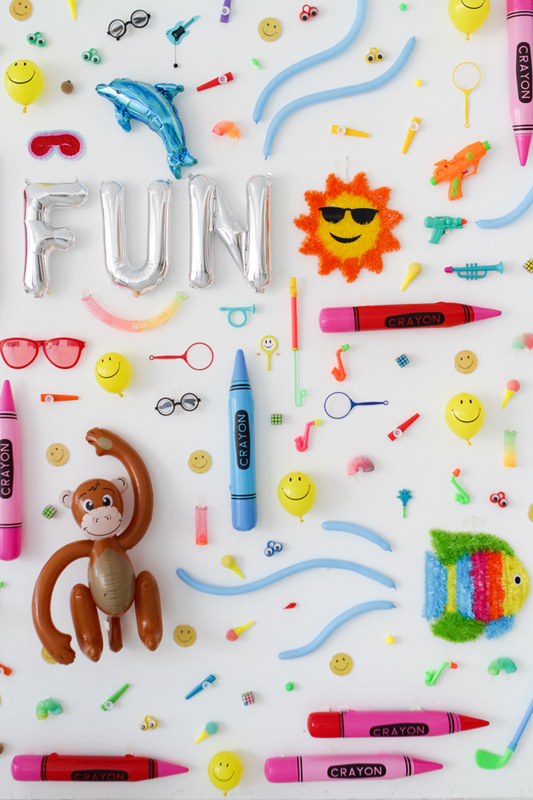 If you want to take a more curated and designed approach, Party City is excellent as they do offer individual favors. However, keep in mind this approach will make your wall a tad pricier. Finally, use gaffers tape or removable double-sided tape to attach your toys to the wall. 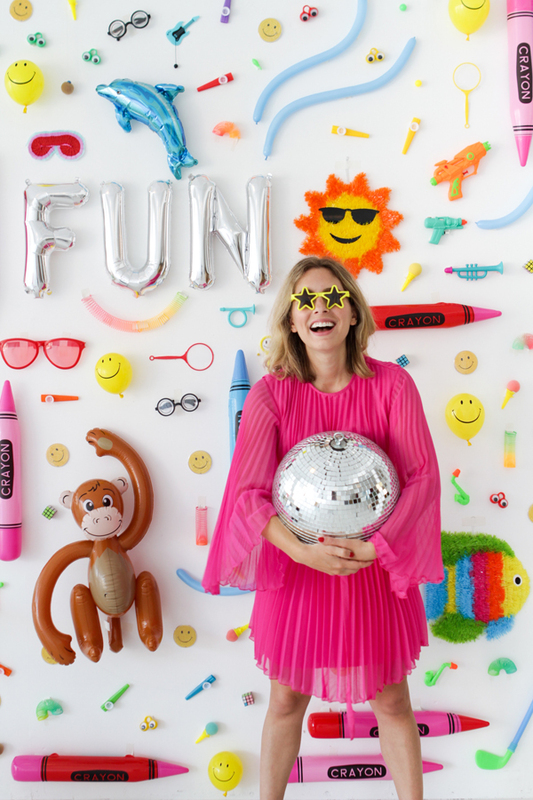 Also, just as a parting tip, it might be kinda fun to let your guests raid your wall for favors when the party is over! This is so so cool! Love the monkey! This is so funky! Way cheaper than getting photo booths or even a good idea to add to a wall in a spare room to jazz it up a little bit! So fun! Kind of reminds me of I Spy. Love the dress, too! Where’s it from? The dress is from ASOS! Such a clever idea and big bucks look.! Pinned it! This seriously is so fun! I’ll definitely keep it in mind for my next party! This is a great idea. I think it will go over well for my 1 year olds birthday party in a few weeks. Thanks! 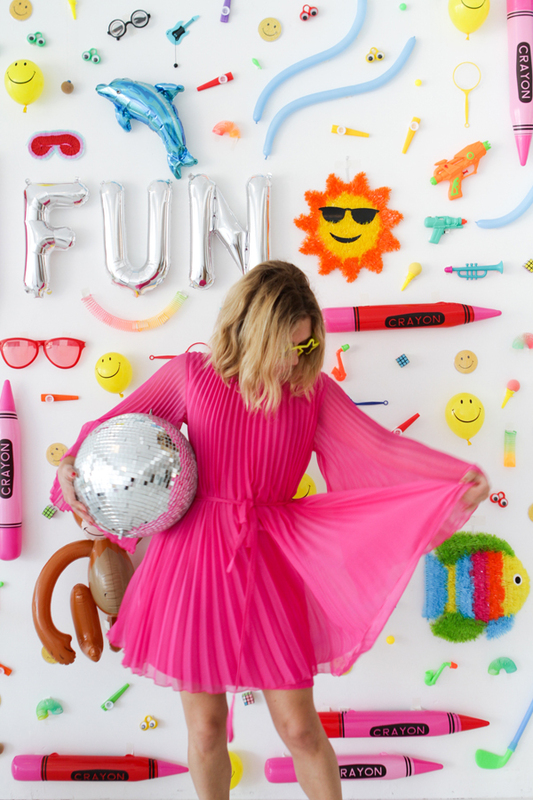 Backdrop and party favors in one. I love it! The wall is cool, but that dress! LOVE that.. may I ask where you got it? Perfect for an upcoming wedding.